The lavish culinary adventure—with mouthwatering recipes—of one woman’s surprising journey from medical professional to master pastry chef. A nurse who loved to bake on weekends, Susan Holding decided to turn her hobby into something more when she entered Le Cordon Bleu’s pastry program in Paris. Within a year she graduated with honors, left her nursing career, and opened her own bakery and cooking school, the Little French Bakery, in Wisconsin. 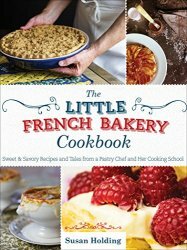 The Little French Bakery Cookbook weaves charming stories and color photographs of Susan’s time in pastry school and Paris with over a hundred recipes she has mastered and simplified for anyone to enjoy. Readers will find classic French recipes and homegrown traditional family recipes, as well as adaptations for gluten-free ingredients and accessible recipes from world-renowned famous chefs. Susan provides equipment lists and tips to aid readers in becoming masters of their own kitchen. Step-by-step photos bring seemingly difficult pastries into your home. Whether new to baking or comfortable in the kitchen, everyone will find something to sink their teeth into.